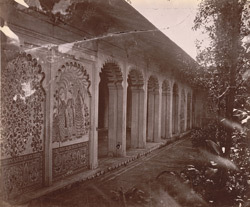 Photograph of a colonnaded pavilion opening onto a garden in the City Palace, Udaipur, taken by O.S. Baudesson in c.1882, from the Archaeological Survey of India Collections . Udaipur was founded by Udai Singh (ruled 1567-72) in the mid-16th century as the fourth and last capital of the Mewar State, and is situated in a valley containing three lakes: Lake Pichola, the Fateh Sagar and the Umaid Sagar. The City Palace, begun by Udai Singh, is built on the east bank of Lake Pichola. The precise location of this view is unidentified but it shows a colonnade of cusped arches culminating in two blind arches in the foreground. These arched recesses are decorated with wall paintings featuring floral motifs and courtly subjects in keeping with the garden setting.